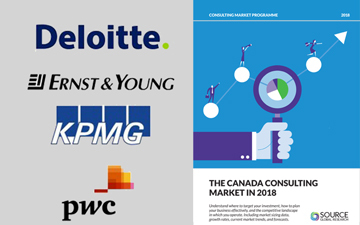 TORONTO, June 27, 2018 – The Big Four are dominating the Canadian consulting landscape, competing “neck-and-neck” with technology firms in the lucrative digitization space, according to “The Canada Consulting Market in 2018,” a new report from Source Global Research. The Big Four had a big year in 2017. They dominate the group classified by Source as Type A: firms that provide consulting services alongside audit, tax, and corporate finance services. Breadth of service is an advantage of the firms. According to the report, the ability of the large firms to offer a wide and deep solution set makes them a safe choice for clients unsure of where best to turn for support. This perceived risk is overstated. According to the latest annual inspection report from the Canadian Public Accountability Board (CPAB), the Big Four firms audit approximately 98 per cent of all Canadian reporting issuers by market capitalization. Audit rotation is not mandatory is Canada as it is other jurisdictions around the world. More likely is the perception that, as lucrative consulting services begin to dwarf traditional audit and assurance work, auditor independence will be compromised and lead to a series of accounting scandals and regulatory scrutiny, as is occurring currently in the U.K. The report forecasts growth of six per cent annually for the Big Four over the next two years, as companies continue to spend on digital solutions across all sectors. In 2017, growth was strongest for consultants working with healthcare clients, but financial services clients remained the biggest consulting buyers. The Big Four firms, through the acquisition of tech companies and product development, have benefited from the growing popularity of asset-based consulting solutions, advising on tools and products rather than human capital, as part of a “mature suite” of services to clients. Colin Ellis is the managing editor of Canadian Accountant. “The Canada Consulting Market in 2018” is available for purchase and download from Source Global Research. Access the firm’s other reports here.